For supported logging endpoints, Fastly allows you to encrypt your log files before they are written to disk. The files are encrypted using OpenPGP (Pretty Good Privacy). Follow the instructions shown in your terminal application. Enter your email address and set a passphrase when prompted. Remember the values you enter. WARNING: Keep your private key safe! If you lose it, your encrypted log files will be permanently unreadable. 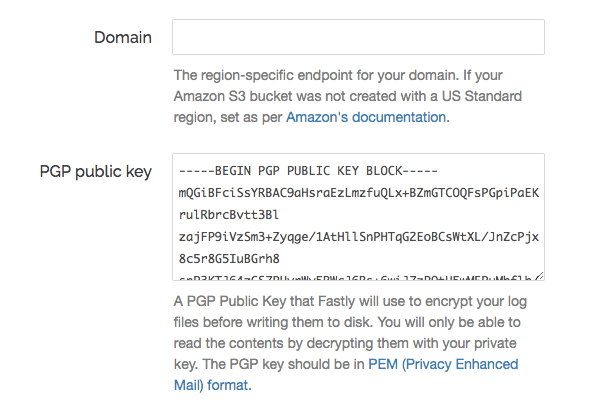 To enable PGP encryption for a logging endpoint, copy and paste your public PGP key into the Fastly web interface. Follow the instructions in the logging endpoint guides. Enter your passphrase to decrypt the log file.